July 22, 2013 - United Parcel Service (UPS) placed an industry first order for 1,821 fire resistant shipping containers. The implementation of these unit load devices (ULDs) represents a milestone in aviation history, offering unprecedented protection from intense fires. Delivery of the new containers will begin this September and is expected to be complete by early 2014. The move by UPS to obtain fire resistant shipping containers comes as a result to an incident the occurred back in September 2010, when a UPS Boeing 747-400, Flight 6 a cargo flight flying from Dubai International Airport to Cologne Bonn Airport crashed killing its crew. Flight 6 attempted to return back to Dubai International Airport as a result of smoke in the cockpit. It was UPS first fatal air crash. The crash caused an examination of safety procedures protecting airliners from cockpit smoke. 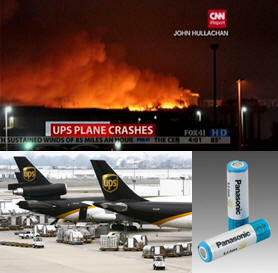 In October 2010, the FAA issued a Safety Alert for Operators highlighting the fact that the cargo on board Flight 6 contained a large quantity of lithium-ion batteries, these types of batteries have been known to cause fires. The FAA issued a restriction on the carrying of lithium batteries in bulk on passenger flights. In May 2012, United States Postal Service banned shipping anything containing a lithium battery to an overseas address. However, the U.S. postal services lifted the ban in November 2012, as a result of customer complaints. The containers are built with a revolutionary new panel material, MACROLite, a fiber-reinforced plastic composite similar to the material used in ballistic body armor. Burn testing conducted by UPS and the Federal Aviation Administration (FAA), and observed by the NTSB, has shown that a ULD with MACROLite panels can contain a fire with a peak temperature of 1,200 degrees Fahrenheit for more than four hours. That time frame would give a flight crew ample time to land safely in the event of an in-flight fire. “We have tested these containers in the laboratory and in live operations. They will enhance safety and increase durability, and they are lighter, which will reduce fuel burn and supports our ongoing sustainability efforts,” said UPS Airlines President Mitch Nichols. - Fire containment covers for cargo pallets: UPS has purchased 575 of the covers, which can contain a 1,200-degreefire for four hours. - Quick donning, full-face oxygen masks for pilots: UPS is installing these masks, which can be put on with one hand in three seconds, throughout its air fleet by the end of 2014. - The Emergency Vision Assurance System (EVAS) for pilots: UPS has completed installation of this inflatable cockpit vision system on our 747-400 fleet. The system enables pilots to see their instruments and out of the front window when smoke is present.